Sherri Shepherd’s Divorce: Is It a Wake-Up Call for Women? 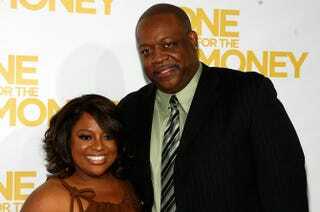 Sherri Shepherd and Lamar Sally attend the premiere of One for the Money at AMC Loews Lincoln Square on Jan. 24, 2012, in New York City. Though she and her co-hosts regularly discuss the marital woes of other celebrities on their daytime talk show, The View, in recent days Sherri Shepherd has been noticeably silent about the relationship problems of one particular celebrity: her. Multiple outlets have reported that Shepherd’s husband of three years, Lamar Sally, filed separation papers with Shepherd and filed for divorce shortly thereafter. While divorce is not an unusual occurrence today, particularly among celebrities, the circumstances of Shepherd’s divorce are unusual and have struck a nerve among women. According to reports on the separation and divorce documents filed by both parties, Shepherd’s husband has filed for primary custody of the fetus currently being carried for the former couple by a surrogate mother. And it has not gone unnoticed that if Sally were to be awarded custody, he would benefit by receiving child support from Shepherd. It’s noteworthy because documents indicate that the two have a prenuptial agreement that would otherwise leave Sally with very little of the comedian’s fortune because their marriage is dissolving in less than five years. Of course the reality is that the same duplicitousness that Sally is being accused of is no different from behavior plenty of women have likely engaged in. When I interviewed Raoul Felder, the famed attorney known for representing celebrities and celebrity exes in divorce, custody and child support disputes for an article for The Root on child support laws, he admitted that he had had clients whose sole source of income was having kids by different wealthy men. If we as women are going to express outrage at a man relying on a woman for his “come up,” so to speak, we should denounce women who engage in similar behavior. Not only is it unfair to those being taken advantage of (including children brought into such circumstances), but it also makes the rest of us look bad. But there is perhaps a more valuable lesson we can all take away from Shepherd’s story. Part of what has clearly resonated with many of the women heatedly discussing and debating Shepherd’s situation online is that her story happens to tap into one of the cultural lightning rods facing modern American women. We are constantly being told in news story after story how hard it is to get a man—particularly if you are a black woman. Allegedly, either black men are busy pursuing partners of different races, or eligible black men are not our financial and professional equals—and, supposedly, other races don’t find us attractive. This hasn’t been my experience. I know there are plenty of men—black, white and every race in between—who adore black women, because I’ve either been in relationships with them or had the opportunity to be and declined. As have plenty of my beautiful black female friends. But society does a great job of making black women feel as though we have to settle, as though having any man—whether he treats you poorly or treats you well, whether he is your intellectual equal or not—is better than having no man at all. In 2014, no woman should be saying that or thinking it. I’m not calling Lamar Sally half a man. But I am saying that Sherri Shepherd is at a certain professional and financial level and chose to marry someone who is not. That’s not to say other qualities do not matter in a relationship. Kindness, sincerity and true love certainly do. But the behavior alleged in their separation and divorce papers doesn’t indicate a relationship brimming in those qualities, either, which raises the million-dollar question: What, exactly, was he bringing to the table?